Phila Anderson, 99, died Monday, October 30, 2017, at Pinicon Place, Anamosa, following a sudden illness. There will be no service at this time; Phila has deeded her body to the University of Iowa. Goettsch Funeral Home is assisting the family. 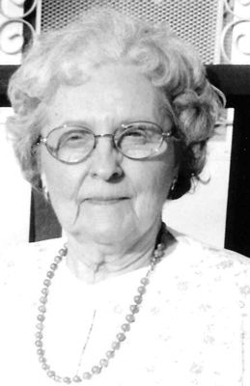 Phila Louise Dufloth was born December 17, 1917, in Anamosa. She was the daughter of Phillip L. and Kathleen (Oliver) Dufloth. Phila graduated with the class of 1935 from Anamosa High School. She married Robert E. Newhard on February 5, 1939. The couple later divorced. Phila was employed by various businesses in Anamosa before going to work at the Jones County Treasurer’s Office. After nineteen happy years in Jones County, she transferred to Scott County in 1972 and became the Deputy Treasurer. In 1973, she married Clarence (Andy) Anderson, who also worked for Scott County. The couple both resigned in 1977 and enjoyed ten years of retirement together. Andy would precede her in death. Phila returned to Anamosa in 2014 to live out her final years. She is survived by her son, Robert G. Newhard, Anamosa; grandsons, Ryan, Dustin and Derek Newhard; and two great-grandsons, Hunter and Jackson. She was preceded in death by her parents; her husband, Andy Anderson; a son, Steven Newhard; a grandson, Aaron Newhard; a special nephew, Jerry Currie; and three brothers and three sisters.